If you’re looking for real-sounding solo and rhythm guitars, MusicLab’s RealGuitar offers everything you need. 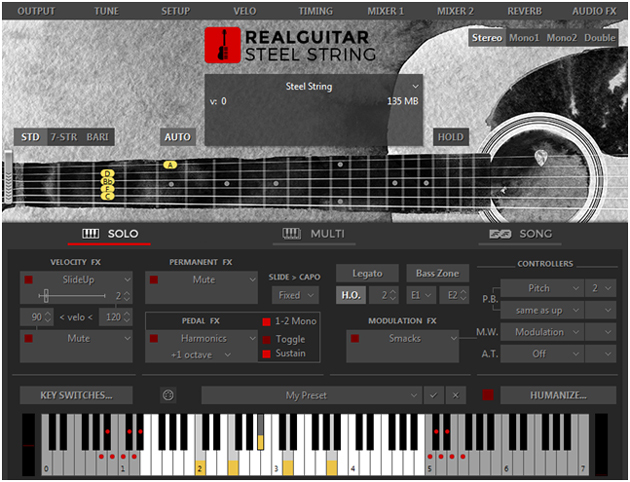 RealGuitar 5 is a sample-based virtual instrument that transforms every keyboard player into a perfect sounding guitar player. Chords played on the MIDI keyboard are automatically converted and all important chord types are recognized correctly. Keyboarders are becoming guitar virtuosos, using a variety of guitar playing techniques like strumming, picking, muting and sliding. 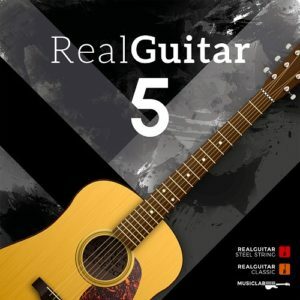 Real Guitar also provides the ultimate library of high-quality acoustic guitar sounds. The two included guitar instruments offer a total of 13 different acoustic guitars with steel and nylon strings, fingered and picked as well as 12- and 14-string guitars. Last but not least, the 1250 package provides professional rhythm guitar patterns that cover a wide range of musical styles, and turn each song into the great guitar accompaniment. RealGuitar Classic – includes all of our original guitar models with loads of new playability features. RealGuitar Steel String – features the debut of our new Steel String guitar sample set. New high quality 24-bit stereo samples. 6-string, 7-string, Baritone guitar tunings. 12-string Standard and Baritone guitars. Nashville Tuning for Standard and Baritone guitars. Authentic, deep velocity response with controllable Buzz and Slap noises. Up to 30 different samples for repeated notes. Stop Slap, Stop Strum sound FXs. Palm Mute sound with tightness control. Combining various guitar techniques (strumming, soloing, string picking, etc.) in a single performance layout. 25 new Key Switch FXs in chordal modes. Velocity controllable number of strings in strummed chords. Live control of solo and strum techniques. Live control of chord inversions/positions. Free voices leading in strummed chords. Hammer-Ons and Pull-Offs in chords. Numerous performance options, effects, and their combinations. Internal Loop in Song mode. 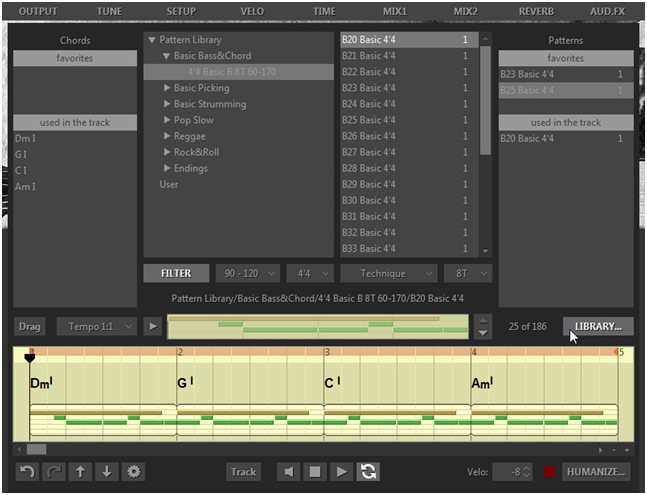 Use of DAW MIDI track to edit and play Pattern track. The unique Floating Fret Position technology, which imitates change of fret position of a guitarist’s hand on the neck. This gives you the possibility of playing on up to 104 guitar frets using just 43 keys of a standard keyboard! MusicLab´s original Guitar Touch technology letting you easily imitate basic guitar techniques (strumming, plucking, sliding, bending, muting, etc..), using standard MIDI keyboard and MIDI controllers, such as Pitch Bender, Modulation Wheel, Sustain Pedal, Aftertouch. The unique Struminator technology letting you use alternative MIDI controller (standard Guitar Hero game controller by Activision Inc.) for creating authentic guitar accompaniment parts with ease and fun. Guitar Rhythm Pattern technology providing powerful Pattern Manager completed with huge MusicLab Guitar Pattern Library (includes 1250 guitar rhythms) for easily creating guitar accompaniment tracks. Song Mode turning RealGuitar 4 into a powerful and easy-to-use songwriting tool allowing you in no time create perfect guitar backing tracks for your songs. 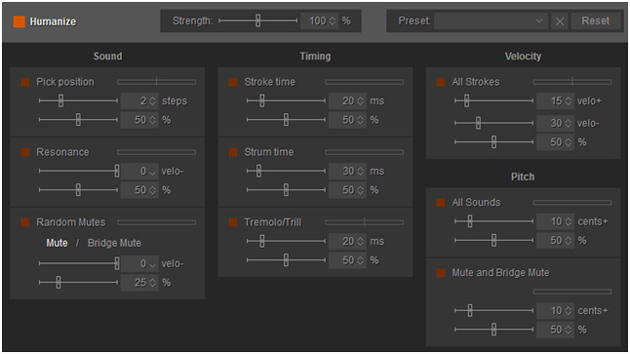 Simply insert chord symbols and rhythm patterns into the built-in Song Track – and your guitar part is ready! Advanced Humanize section allowing to easily add realism to the performance, both live and step-recorded in a MIDI track, or automatic. Importing Chords from the WEB page – Find chords/lyrics content of the needed song on any site, select the text with a mouse, drag and drop it directly into Favorites section and instantly get ready to use chord set for your song! In RealGuitar MusiLab realized the Floating Fret Position principle, which imitates change of fret position of a guitarist’s hand on the neck. This gives a unique possibility of playing on up to 122 guitar frets using just 50 keys of a standard keyboard! This, along with the fact that we have sampled 19 frets of the first string and 16 frets of the others (2-6 strings) for all of our guitar patches, allows you to emulate a guitar performance with maximum sonic accuracy.